As much as I hate the typical 'new year, new me' rubbish, (I'm still living in pjs, trying to resist ordering pizza and watching netflix, a la 2013) I did feel the need for a change. I'm so spontaneous with my hair, I'll wake up one day like, 'right, I need to cut in a fringe' or 'I need a turquoise dip dye' (anyone remember that?) 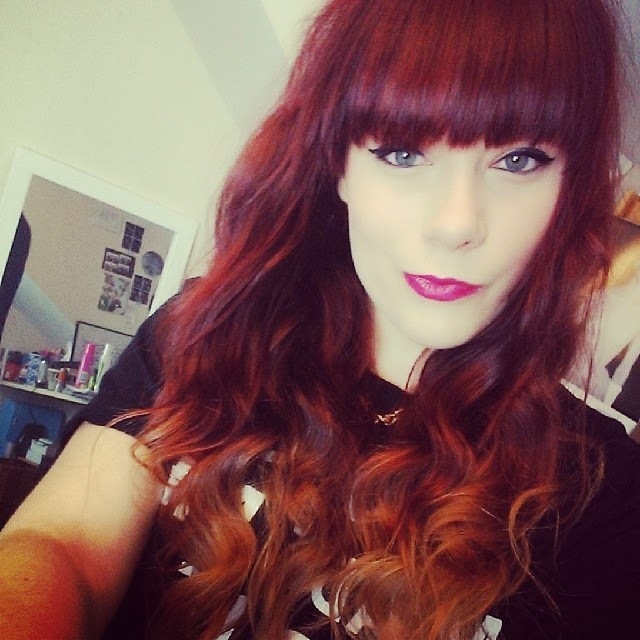 So yesterday the fringe returned as did the vibrant red with reinforced ombre. To achieve this look, I used L'Oreal Casting Creme Gloss in Cherry Red and Decolour Hair Colour Stripper to get the ombre. In the above video I show not only how I achieved the style shown in my Instagram photo, but also the products I'm now using on my hair to keep it healthy after obliterating it with colourants and decolourants! I also give you the chance to win a Nicky Clarke Mayfair Multi Styler (my new favourite curling iron) worth £69.99. So be sure to subscribe to my channel and watch the video to find out how to enter!